A woman who desires two children will spend three decades of her life trying to prevent an unintended pregnancy. Contraception allows parents to choose the number and spacing of children. Each year, family planning programs prevent an estimated 187 million unintended pregnancies, including 60 million unplanned births and 105 million abortions, and avert an estimated 2.7 million infant deaths and 215,000 pregnancy related deaths. The prevalence of contraceptive use differs across the world depending on differences in desired number of children, awareness, funding, and access to care. Female sterilization and intrauterine devices account for nearly 40% in less developed regions, and pills, intrauterine devices, and condoms for the same proportion in more developed regions. The IUD (IntraUterine Device) is a long-acting reversible contraception method. It is a small T-shaped plastic device placed inside the uterus by a trained health professional. IUDs are extremely effective, with a failure rate of less than one pregnancy per 100 women—compared with 9 per 100 women on the Pill. Of all contraceptive methods, this is one of the least expensive, longest lasting forms of birth control available to women today. IUDs are totally reversible. The hormonal IUD releases progestin. One hormonal IUD is approved for use for up to 5 years (Mirena). Another hormonal IUD is approved for use for up to 3 years (Skyla). 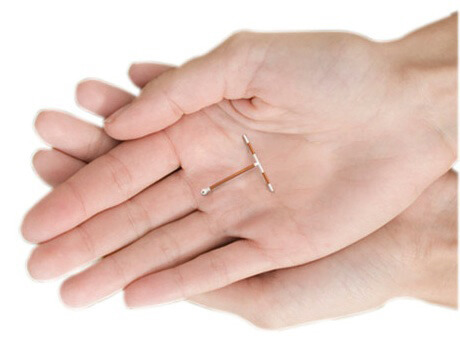 The copper IUD (ParaGard) does not contain any hormones. It is approved for use for up to 10 years. How do intrauterine contraceptives work? Both types of IUDs work mainly by preventing fertilization of the egg by the sperm. The hormonal IUD also thickens cervical mucus, which makes it harder for sperm to enter the uterus and fertilize the egg. It also keeps the lining of the uterus thin, which makes it less likely that a fertilized egg will attach to it. The hormone releasing IUD (Mirena) causes thinning (but reversible) of the lining of the uterus making it successful in treating heavy painful periods. Studies show that fertility returns shortly after removal of all intrauterine contraceptives. What are the adverse effects and complications of intrauterine contraceptives? Insertion of intrauterine devices can be painful. Rarely, uterine perforation occurs. Copper bearing IUDs may cause periods to be heavier and may cause more cramping. Non-steroidal anti-inflammatory drugs (Ibuprofen and Aleve) reduce bleeding and pain associated with the use of an IUD. According to recent evidence, IUDs do not increase the risk of pelvic inflammatory disease unless inserted in women with pre-existing gonorrhoea or Chlamydia infection. Women using a hormone releasing IUDs may have more days of spotting or bleeding during the first six months, acne (if already prone to it), breast tenderness, or mood change. The persistence of these side effects may require the removal of the device. Twenty percent of women experience no menses one year after insertion of the hormone releasing intrauterine system. The IUD is a very effective, long acting, reversible method of family planning, giving women choices. I believe that a woman who controls her fertility controls her life. Every woman should be free to decide whether and when to have children.